Rustic and idyllic, this South Hero cottage boasts pine floors, a dock, and a great location by the water. Situated at the end of a private dirt road, this home is secluded and surrounded by a copse of trees and a pasture. You're within walking distance of South Hero mainstays such as Zebs Snack Bar. A built-in porch surrounds three sides of this turn-of-the-century home. The sitting roam has a sofa and printed chair; the living room, two wicker armchairs, a flatscreen TV, and antique wood stove. Set inside the screened porch, the dining area has seating for four at a table as well as two wicker chairs. The kitchen features a fridge, gas stove, microwave, dishwasher, and cast-iron pans. There's also a gas grill outside for BBQs during the summer! There are three bedrooms here, able to accommodate up to eight travelers (four adults maximum). The master boasts a queen bed and wood paneling. The second bedroom has two twins and the third bedroom has a twin bed, with two camping cots available. There's a full bath as well. The screened porch offers many spots to enjoy the view, from the daybed or couch. Head out to the four lawn chairs near the fire pit on a cool summer night or take a trek to the private dock down below (please note that there are no guarantees that the dock will be available to use, as the water level changes seasonally). This home has a small deck and a kayak for your use. South Hero is a peaceful refuge from the everyday. White's Beach lures locals and tourists every summer and Bird House Forest boasts colorful birdhouses hanging from hardwood trees. 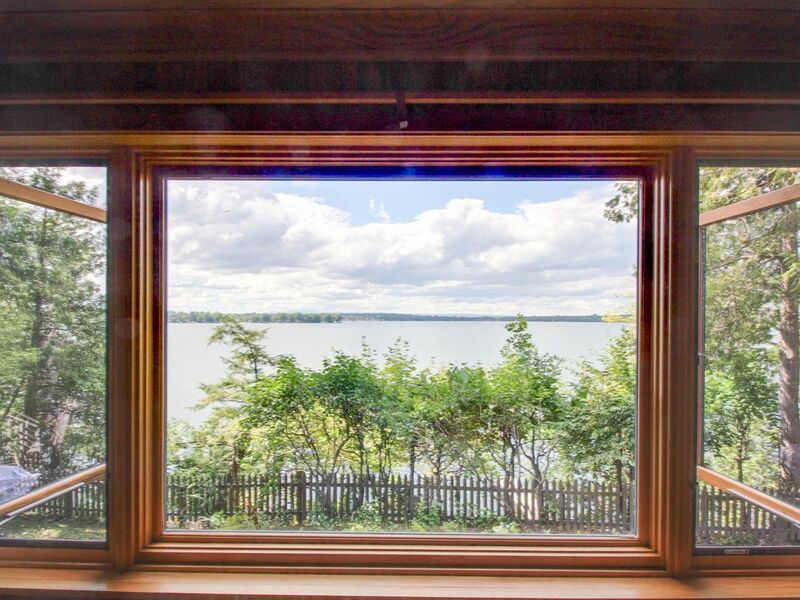 This cozy and tranquil Lake Champlain home is the perfect spot for your next vacation. *Please note that the home's water is not potable. Drinking water will have to be brought in. Dock Details: There is an aluminum dock to access the water or tie up a small boat, when the lake level gets low enough and the water is warm enough to put it in! SMALL BOATS ONLY! Level of the lake changes as well...so just row boats, Kayaks etc. Dock cant handle anything bigger than that. Water Access: Direct Lakefront Property with access to shoreline via stairs. Thanks for considering a Vacasa home! We provide full-service management for privately owned vacation homes, and like to think that we offer our guests the best of both worlds: the unique experience of staying in a one-of-a-kind vacation home, with the peace of mind that comes from knowing that the home you book for your special vacation is cared for by professional housekeepers and property managers. <br> <br> Vacasa began in 2009, simply because our founder and CEO Eric wanted to find a better way to share his wife’s family’s summer home in Long Beach, Washington with guests as a vacation rental. Eric and his early team worked to build Vacasa on the premise that local employees can do what they love most (taking care of guests, homeowners, and properties), while the hands-off tasks of vacation rental management—things like marketing, filing taxes, and maintaining a website—could be handled by a specialized central support team. <br> <br> Our passion is connecting travelers with the unique experience of staying in a vacation home, and we would be honored to be your host. Please contact us with any questions about this home��our team is standing by! The pictures just do not do this place justice !! 10/10 would go back again. Great view, loved the firepit. Very cute and comfortable. We truly enjoyed our fall getaway. This was a perfect spot, very private setting and close to Burlington. The views on the way into South a hero are beautiful all times of day. The cottage was ver clean and comfortable. We will consider this cottage again next year! You just cannot beat this place for sunset views across the lake to the NY mountains. It's rustic and cabiny, but very clean and comfortable. Great secluded location, too. Great secluded spot! Clean and spacious. South Hero is a little remote and it's great if you are looking to get away! This is a great quiet place. It is like being in your own little bungalow.